Dyanie asked in one of my previous posts how the ferry looked like. Here are some of the photos that I took while in the turbo jet. 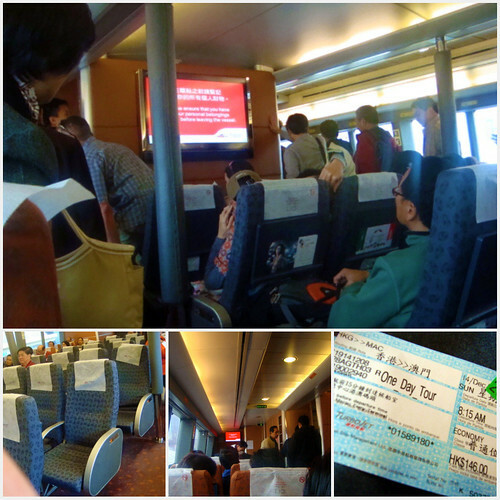 I could say that the almost 40-minute ride from Hong Kong Terminal was a smooth one. 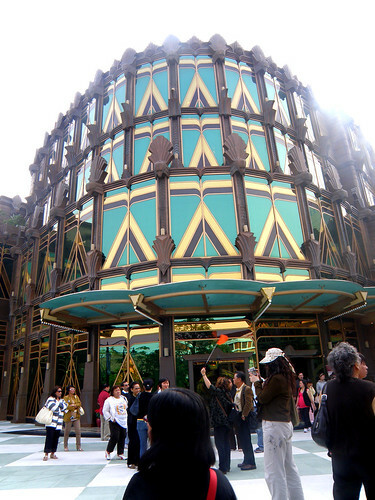 Although I wanted to invest on nap I did not because I enjoyed peeking in and taking snaps during the ride. 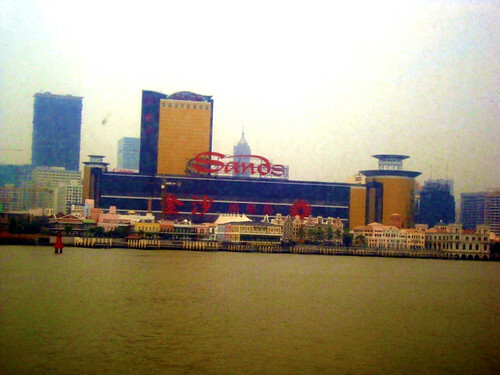 On board in turbo jet, we already caught a glimpse of Sands Macau. 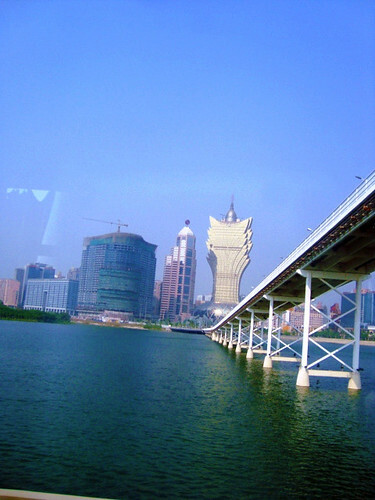 A strong cue that Macau’s economy is mainly dependent on gambling industry among other things. The tour guide earmarked our lunch to be spent in Macau Fisherman’s Wharf. 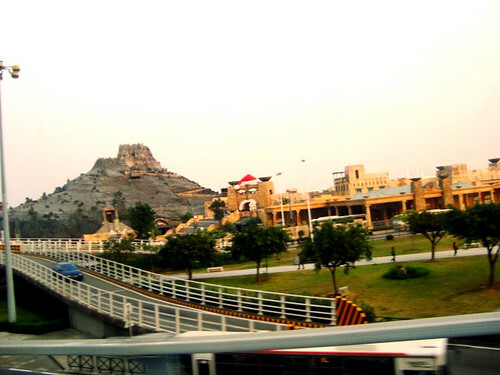 While in the bus, we were oriented about the things that we will be seeing, a visit to Casino Babylon included. 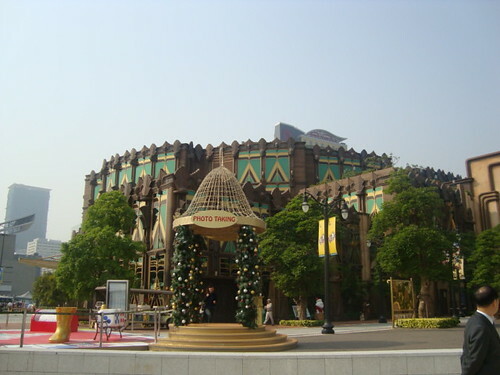 Casino Babylon is the oldest casino boutique in Macau. We never really got to play inside because you will never find it as part of any day or night tour package. Especially in our group wherein there were Singaporean, Indian and Filipino who are not yet of legal age. While the guard was busy making a big deal on why our group went in despite of these underage charming fellows, I managed to take only one photo while inside the casino. After our guide made the necessary explanation to the casino personnel, i.e. 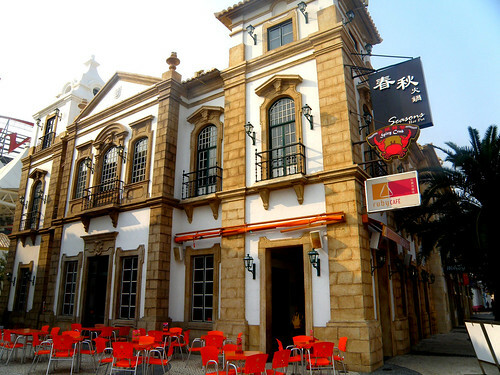 that our group was just passing by as part of the tour, we proceeded to the Macanese buffet waiting for us. Honestly, I didn’t like the food at all that I didn’t care to take photos of it. I bet they are not the finest Macau dishes. The consequence of being in a package tour is you have to go with the flow, normally lunch or dinner is more than economically considered. But the dining area is interesting enough to counter this flaw. 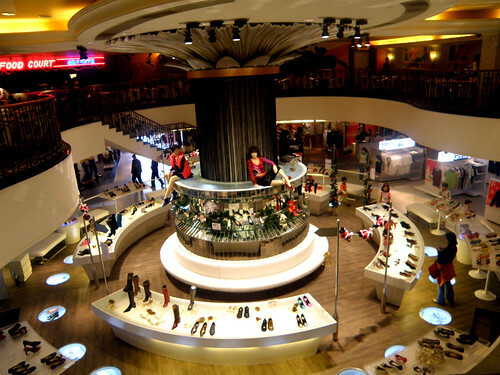 I enjoyed the fancy car-dining set-up and the sight of shoe store as I did look down. After lunch, we were given almost sufficient time (I realized later on that there’s so much to check here). Our group dispersed and we started appreciating the different corners of Fisherman’s Wharf. I didn’t know that this is actually a theme park. 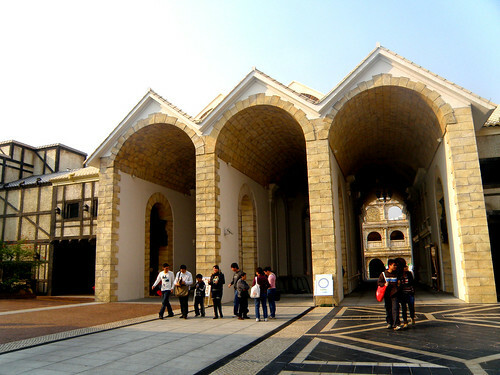 The first ever in Macau. It became glaring only when I started to see structures inspired by different theme buildings: Italian, Spanish, etc. It was like walking through the different eras or quasi world tour, whichever way you’ll feel. If I’d get a chance, I want to revisit this at night time. 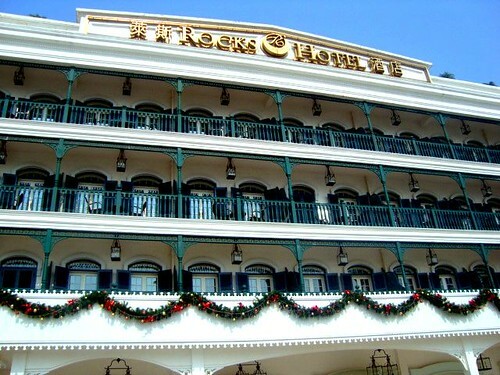 I can just imagine how livelier the whole place will be once it is all lighted up fancifully. They are also holding shows in that late afternoon which we did not catch because of time limits. One of the finest attractions here is Vulcania. 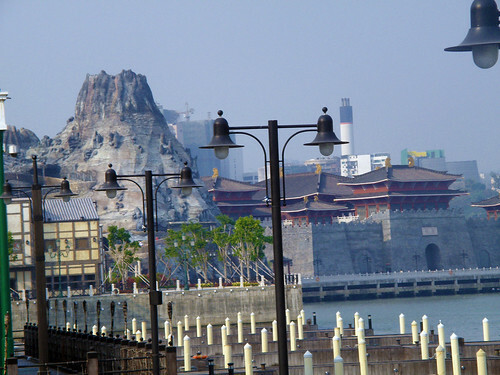 It is a replica volcano that will instantly get your attention even if you’re outside the Fisherman’s Wharf. The best spot to rest your tired feet and senses is here. It was breeze. 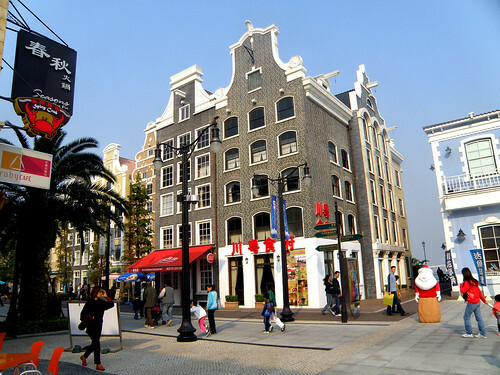 wow lovely photos as always, it was strange seeing a traditional amsterdam building with chinese writings in front of it hehe. 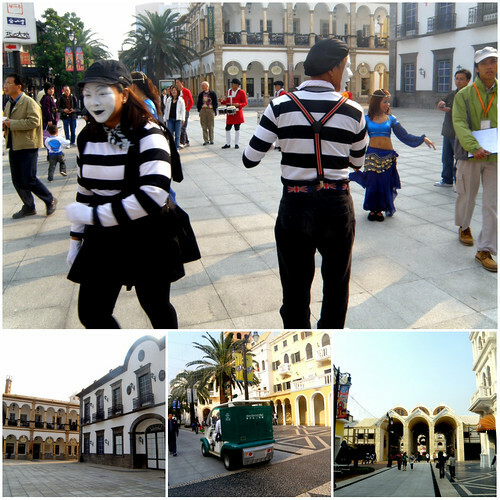 wow nice shots of macau. theme park ba yan? ang ganda naman at kakaibang theme park. i like the fancy car dining set up too. the place looks lovely. i agree. i think it would be great place to walk through at night. 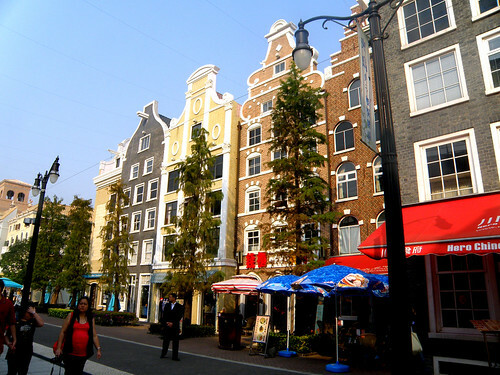 ganda pala ng macau…hehehe this means isa to sa mga countries na dapat ko i visit. Ganda nung car setup sa buffet, too bad about the food though. Mukhang mas colorful nga sa gabi. 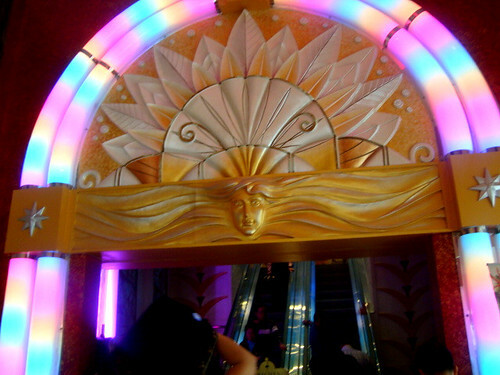 And it would be nicer to spend the night there and gawk at how people play in the casino. 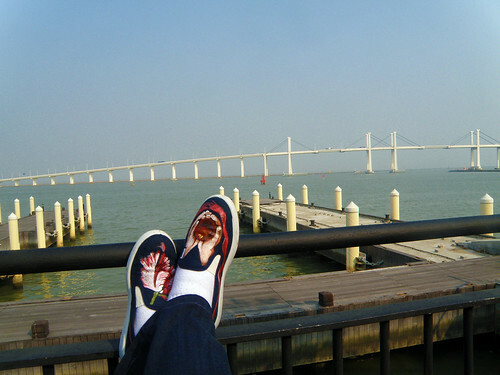 OMG, I love every pic in this post, all of your HK adventures make me want to travel there. Pronto! beautiful! i like every picture here. ganda pala ng macau. and yes, parang may kakaiba syang ganda kapag gabi. next time jo, try mo and share it with us again. hehehe. with all your travel posts, para na rin kaming nakakapagtravel to different places. 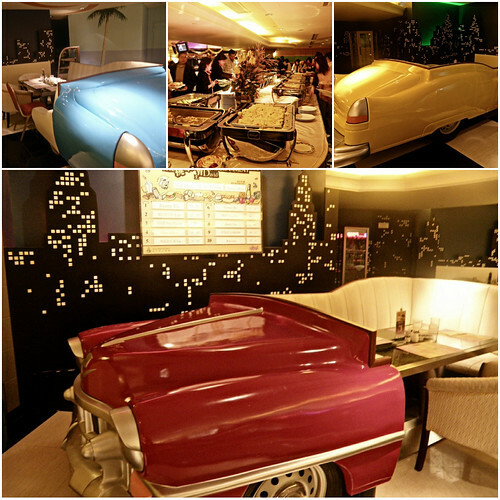 Yung resto, it reminds me of “Pulp Fiction”. Celebrity look-a-like din ba ang mga waiters and waitresses? I’ve been to Hongkong a couple of times but darn, I passed up on visiting Macau on both trips 😯 I have to visit Macau ! we went to Wharf during nighttime. I think it was more beautiful there on daytime. Sayang. hehe. ganda ng lugar no? btw, nice pictures! edelweizas last blog post..dNeero Conversation: How Healthy Are You? Macau certainly looks like a wonderful place to visit. I like the fancy car-dining set-up too. Glad the interior compensated the not-so-great food. The theme buildings are beautiful. dyanies last blog post..I’m baaaack! During our ride, the sea was peaceful naman. I read that it’s normally stormy/rainy in Macau between July and November. I’ll be going home this April sayang if i discover your blog earlier nsama sana sa itinerary ko Macau.